Aaron Razel’s just released the first single from his new upcoming album which contains a duet with Shuli Rand .New song, new beginning, with a wealth of soul music soul singer, who gained a considerable fan base. Razel’s name is not new to Jewish music fans. Aaron, has a master’s degree in composition, plays the piano, guitar and belongs to an active musical family. His younger brother Yonatan Razel and his cousin of the violinist Nitzan Chen Razel. 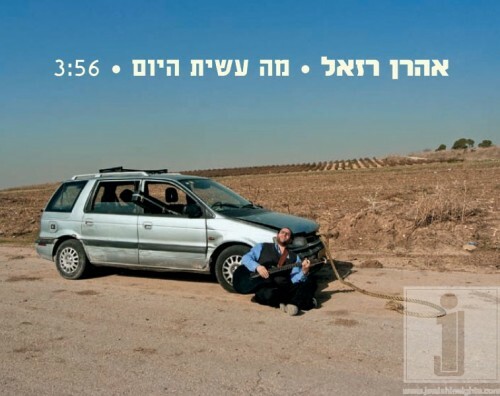 He collaborated with Ariel Zilber, Kobi Oz and Shuli Rand and is considered among Nahshonim broke the barrier of traditional Hasidic music to the popular original. Razel’s musical style ranges from rock, world music, soul music, reggae, happy with catchy rhythms, and without compromise on the texts, engaging in Israeli society, faith and what between them. The song “Ma Asita Hayom” was written early last personal makeover Razel. Razel had been part of the process around Safed and wild mountains, making songs with no instruments. 14 years later he returned to the studio and gathered these materials. The result is songs that manage to touch it who lives in Jerusalem, one who lives in central Tel Aviv and those who love music as such. The album will be distributed by Hatav Hashmini.